During the late 6th century AD, the island of Britain began to undergo a rebirth. Renewed political, cultural and commercial links again start to emerge with the kingdom of the Merovingian Franks. Small quantities of Merovingian gold tremisses have been discovered in England demonstarting that trade with the continent was starting to surface once again. 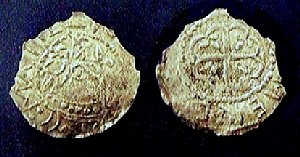 Native Anglo-Saxon gold thryinsas appear to have begun around the 630s. Once again, the local coinage attempted to imitate in the style of their continental prototypes, which in turn were copies of obsolete Roman coinage. Soon, the gold coinage in Britain began to take on a pure Anglo-Saxon style. With the the introduction of gold coinage, the demand appears to have outstripped supply. By the middle of the 7th century AD, the Anglo-Saxon gold coinage was being increasingly debased with silver. By only 675 AD, gold completely disappears being entirely replaced by silver coins known as “sceat” meaning “wealth” or “treasure.” The weight of these early pieces averages about 1.29 grams (20 grains). The silver content appears to have been rather high during the 7th century, but began to decline during the early 8th century under yet another round of debasements. The bulk of money supply production appears to arrive during the 716-757 AD period. In Northern England, the sceat continued to decline in silver content until it was void of any silver whatsoever by the early 9th century. The arrival of the Danish hoards also marked the introduction of what would become the cornerstone of the English monetary system – the silver penny. In France, a new reformed coinage of good quality silver known asdeniers struck on broad flans had been introduced by Pepin in 755 AD. This new silver denier was continued by his son Charlemagne and his descendants and swepted across Europe eventually reaching England as well. The denier was a revival of the old Roman denarius, which had been the backbone of that monetary system for over 500 years. 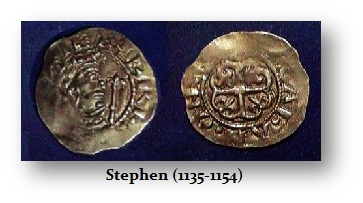 The new silver pennies of England were similar size to the deniers of Euorpe weighing about 1.3 gams. They were most likely introduced into England by Offa, the powerful king of Mercia, sometime between 755 and 780 AD. This new denomination spread quickly throughout England and the the silver penny remained virtually the sole denomination of English coinage for almost five centuries. The penny became the unit of account in legal documents and transactions. During the reign of Aelfred the Great, the English silver pennies reached 24 grains in weight thus yielding the weight standard of a “pennyweight” still used today in gold and jewelry trade. Silver pennies of this period usually show the king’s name, and sometimes his portrait, but also the name of the “moneyer” or person responsible for its manufacture. This is a strange custom from Roman days, particularly the republican era. We even begin to see the issue of a halfpence from the time of Alfred the Great 871 AD. During the reign of Eadgar (959-975 AD), England was united under one ruler. It was Eadgar who instituted a uniform coinage throughout the land. Eadgar set the pattern for the ‘reformed’ coinage of the later Anglo-Saxon and Norman period and standardized the use of the king’s portrait as in old Roman tradition. The reverse of the coinage normally displayed a cruciform pattern with the name of the mint in addition to that of the moneyer. Permission was granted to most fortified towns of burghal status to open a mint with the number of moneyers varying according to the size and importance of the region. In addition, some royal manors were also permitted to mint coinage and some ecclesiastical authorities were granted moneyer authority as well. By the middle of the 11th century AD, some 70 mints had been in operation. Yet with this sheer numbers of mints, control of the currency was still retained firmly in the hands of the central govemment. This stood in stark contrast to France and most of Europe where feudal barons and bishops controlled their own coinage. English coinage types were changed at intervals to enable the Exchequer to raise revenue from new dies and periodic demonetization of old coin types helped to maintain the currency in a good state. By 1066, the Norman Invasion under William the Conquerer found a monetary system in England that was already familiar to the French. Therefore, no major changes in the coinages took place and the French adopted the English controls and the system of periodic changes to the coinage types. However, of the near 70 mints in operation during the reign of William I, a trend toward a major reduction did begin. By the middle of the 12th century, only 55 mints were still operating whereas under Henry II (1154-1189) the number had been reduced to 30 and then and later declined to only 11 mints. The French method of centralizing the monetray authority continued and by the second half of the 13th century, the issue of coinage had been retricted to London and Canterbury, with the exception of two ecclesiastical mints. The formal issue of a halfpence had ended with Eadger. This resulted in the traditional splitting or cutting of silver pennys into halves or even quarters sometimes referred to as “bits.” Finally, under Henry I (1100-1135), a monetary reform took place in 1106-1107 during which the formal issue of a round halfpence was once again authorized. However, the appearance of counterfeits (bronze coins silver plated) were causing may to cut the silver pennies just to test their authenticity. The public was confused and reluctant to accept multiated coins. Around 1107-8, the English authority took quite an extraordinary step. They ordered the official mutilation of all new coins in an effort to force the population to accept the current money in circulation. The monetary crisis, which took place in England at this time, is no doubt similar to that faced by the Emperor Aurelian (270-275 AD). On Christmas in the year 1124 AD, the moneyers were summoned together at Winchester where they were all called to account for their activities. A number are said to have been mutilated themselves for issuing coins of inferior quality. Indeed, much of the inferior coinage was being introduced by the moneyers themselves as was the case in Rome during the 3rd century AD. There is little doubt that poor the condition of the money supply and the lack of confidence in the state to maintain it, contributed to the economic chaos of the times. It is not surprising to find that this period of economic inflation was followed by Civil War and anarchy between 1138-1153 during the reign of Stephen (1135-1154 AD). Stephen of Blois, Count of Boulogne and a nephew of Henry I, crossed the Channel on receiving word of his uncle’s death and secured the throne of England for himself. Henry’s wish was that his daughter Matilda should succeed him. Matilda was the widow of the German Emperor Henry V, and was then currently married to Geoffrey, Count of Anjou. Two years later Matilda arrived in England to claim the throne supported by her half-brother Robert of Gloucester. During the civil war that followed, Matilda and later her son, Henry of Anjou, set up an alternative court at Bristol and held much of the West of England, striking their own coinage. Matilda thus became the first woman of England to strike her own coinage. Many irregular coins were struck during this troubled period, which only added to the sad state of the money supply in England. Eventually, following the death of Stephen’s son, Eustace in 1153, a treaty between the two factions was reached whereby Matilda’s son Henry II became heir to the throne of England and once again a uniform coinage emerged.